Featured on this page are two identical Bell Punch 509/F Sterling Currency models. One is slightly unusual since it is labelled "Property of Automaticket" and the other is very unusual since it is called an Automaticket "Check Adder". It is a model 509/F where the 5 denotes the abbreviated keyboard (keys up to 5), the 09 denotes the 9 columns of keys, and the F denotes a Sterling currency version with farthing (¼ penny) keys. The farthing ceased to be legal currency in Britain in 1961. This casing style was replaced by a more modern version in 1958. This machine is a slightly unusual version, as explained below. The Plus Adder here appears to have been mounted in conjunction with an Automaticket machine, as can be seen from the labelling show in the photographs below. This is not unexpected since an article on the history of the Bell Punch company says "As an adjunct to one of its ticket control systems the company required a small adding mechanism, and in the search for a tried mechanism instead of devising one of its own from scratch, it became acquainted with a small adding machine that was being developed by Petters, Limited, of Yeovil. 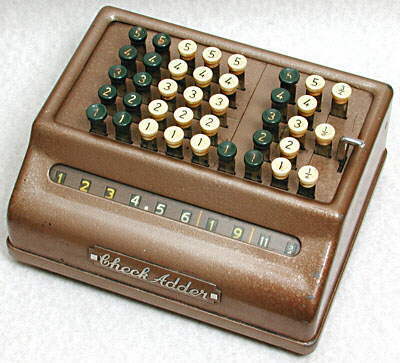 It was not a difficult matter to acquire the rights in this mechanism from Petters and thus it was that that the company embarked upon the manufacture of a small adding machine to which it gave the name Plus. Some tens of thousands of the machines have been sold both at home and abroad." 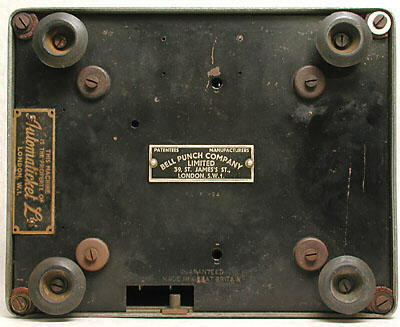 This machine has none of the usual name or model number markings and underneath does not have the normal Bell Punch label with patent details and distributor addresses, instead having a simple Bell Punch Company label. Additionally it has an Automaticket ownership label and an unusual cut-out in the bottom cover and lug at the rear. 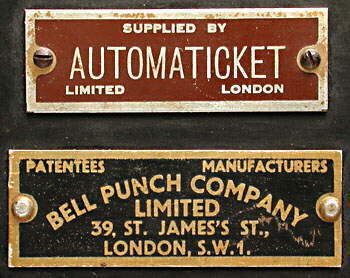 The ownership label; Automaticket Ltd. was a subsidiary of Bell Punch Co. 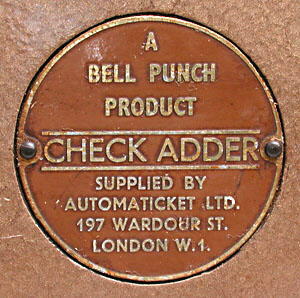 The Automaticket ticket and cash control machines were probably leased by Bell Punch's Automaticket subsidiary, rather than sold, and so would remain the property of Automaticket Ltd. This is common practice for expensive systems, where the leasing company pays for the equipment, perhaps, monthly and also on the throughput, and the owning company maintains the equipment in working order. Unusual cut-out and lug underneath at the rear. This cut-out and lug, underneath at the rear, are an unusual feature. It is obvious that the cut-out has been stamped from a standard bottom sheet and has cut through the original "Guaranteed made in Great Britain" which has had to be stamped again. Originally I had thought that this might be for a connection from the Automaticket machine to the adder so that it automatically totalled ticket sales. However, inside there are no modifications to the standard adder mechanism and so this appears to just be a way of fixing the adder to the top of the Automaticket machine. 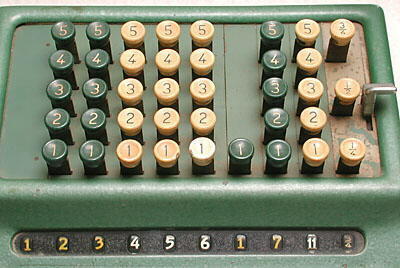 The Automaticket machine operator would then have had to separately enter sales on the adder to keep a running total. If you have any further information on the use of the adders with Automaticket machines please get in touch. This is identical to the standard Plus 509/F model except it is labelled as an Automaticket "Check Adder" and has a brown finish instead of the normal green colour. It is a direct action keyboard calculator of the "comptometer" type. 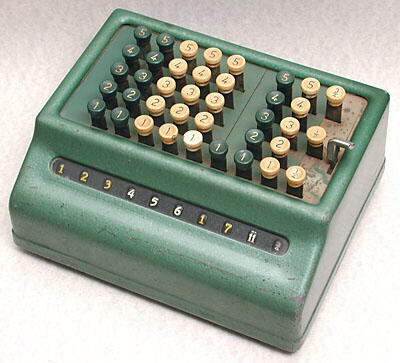 It has an abbreviated keyboard (keys up to 5) and is designed for Sterling currency calculations, including farthings (¼ penny). 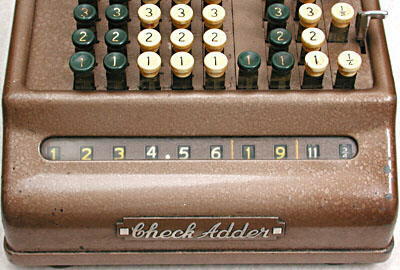 This casing style used here was replaced by a more modern version in 1958, though it is not known whether any Check Adders were made with the later style casing. The name Check Adder is likely to refer to an adder for checking, since the British spelling for a payment order to a bank is "cheque" rather than the American form "check". The label on the back.